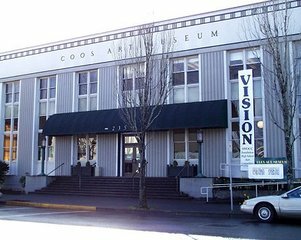 The Coos Art Museum has been the cultural hub of Oregon’s scenic South Coast since 1950. Oregon’s 3rd oldest Art Museum is housed in the historic art deco former US Post Office in downtown Coos Bay. CAM invites visitors to tour exhibits, take art classes, hear lectures and participate in community events. CAM's 530 Permanent Collection of Contemporary Art rotates on display throughout the year, but online visitors can also view it through our website.